The clever Barracuda 21 sport fishing pilothouse boat is the result of the experience gained during the last Barracuda Tours. Sporty, comfortable and modular, this new outboard motorboat comes in two versions with different layouts and has thirty or so options. Her new fishing station promises wonderful fishing sessions at sea. The Barracuda 21 benefits from BENETEAU's vast experience in the development of specific hulls and is built on the latest generation of outboard motorboat hulls. Quick to plane and stable to drive, she is safe underway, but makes no concessions to sensations. 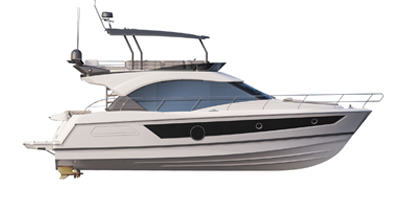 Still loyal to the strong design of this range, the Barracuda 21 has a straight pilothouse that looks particularly robust. Whether for sport or leisure, fishing on the Barracuda 21 is a real pleasure, made easier by the numerous options uniting all the ingredients needed to customize her to match her captain’s identity. Drawing from the experience of the Barracuda Tours, the Barracuda 21 has fishing station unheard of on a boat in this category. Boasting modularity with a removable bench seat aft of the cockpit, she includes a live-bait well (supplied with regenerated seawater) offering ideal conditions for preserving live catches. In a fishing configuration, this really open space offers a pleasant seat to relax on, in addition to the two side benches and sliding bench. With an electronically controlled single engine between 150 and 200 hp and her new generation hull, the Barracuda 21 is stable and fast. Her 53 US Gal tank gives her great autonomy on fishing sites.